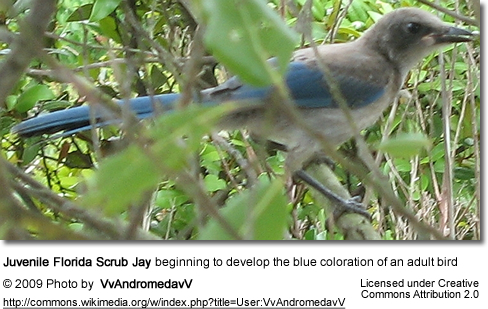 The Florida Scrub Jays (Aphelocoma coerulescens) are one of three scrub jay families found in North America. These blue and grey colored birds are restricted to central Florida, where they inhabit rare oak scrub and scrubby flatwoods on sand dunes. 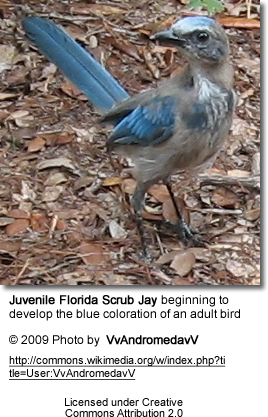 Florida Scrub jays maintain feeding and nesting territories. The appropriate territory for each pair is about 22 - 25 acres (9 - 10 hectares), but due to lack of suitable habitat, some territories are now as small as 12 acres (5 hectares). The smaller territories won't allow the resources to support larger family groups. Smaller groups reduce the number of nest helpers and makes them more vulnerable to predation and territorial attacks. The loss of suitable habitat is mostly a result of urban development in combination with uncontrolled growth of vegetation, specifically the gradual replacement of their scrub habitat by large oaks and trees. The solution to the latter is periodic burning of scrub tracts to maintain the desired shrub height, canopy closure and patches of open sand. This conservation method that has been practiced in recent years. In 1993, it was estimated that 4,000 breeding pairs were in existence. Studies conducted since noted declines of about 33% since the 1993 census. Now the global population is believed to range between 6,000 - 9,000 birds. (Ref. BirdLife Int'l - birdlife.org). They are now classified as Threatened under the Endangered Species Act. A case is being made to replace the current official state bird of Florida - the Northern Mockingbird - with the Florida Scrub Jay (the only species of bird endemic to Florida). These birds are heavily sought by birders who come from afar for an opportunity to observe them and, therefore, hold considerable economic importance. In areas where they are in contact with humans, these birds have shown remarkable tameness and may readily perch on a person's hand, arm or head. They take treats (such as peanuts) out of hands or even from lips. These inquisitive and mischievous birds have also been known to steal shiny objects, including silverware taken from pick nick tables. These jays maintain cooperative relationship with large mammals, specifically the White-tailed Deer, which allow these birds to hop over their bodies and heads to collect and feed on parasites, such as ticks. The complex social dynamics of these birds has been of great interests to scientists and has been well-studied. These cooperative breeding birds form family groups that include a dominant breeding pair and several nest helpers, who will help feed and protect the young, and defend territory against neighboring Florida Scrub Jay groups. These helpers are often previous offspring. These families range in size from two (a single mated pair) up to eight adults and - later on in the breeding season - often includes one to four juveniles. The extended family format increases the chance of their survival, as the individual members will take turn watching for predators, while the rest of the family searches for food. Once an intruder or danger has been sighted, the guarding bird will warn the others, giving them an opportunity to hide - or in some instances all may join in mobbing predators. When a breeding male perishes or is unable to continue to breed, the breeding territory is typically passed on to one of the adult male helpers. 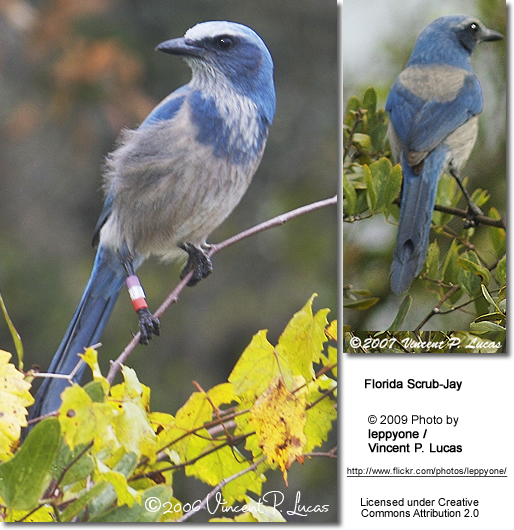 Florida Scrub Jays are found at scattered locations in Central Florida. They formerly inhabited 39 of 40 Florida counties - from Levy, Gilchrist, Alachua, Clay, and Duval Counties southward. These birds are now officially extinct in the following counties: Alachua, Dade, Gilchrist, Broward, Clay, Duval, St. Johns and Hendry Pinellas. 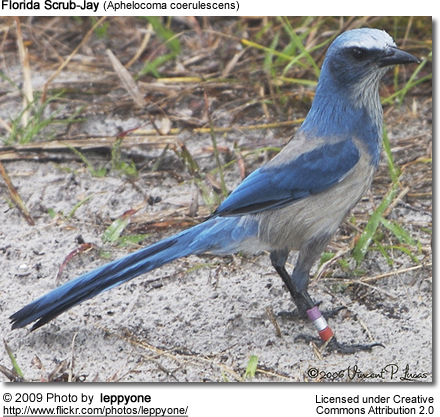 Florida Scrub Jays used to be quite common in the Buck Lake area of northwestern Brevard County (one of the favorite birding locations in Brevard County), and Brevard Zoo has released back into this preserve a couple of breeding pairs, which are monitored by the zoo (Ref. Tracy Frampton, Conservation Coordinator, Brevard Zoo - 2013). Head and neck are dusky brown, turning brown on the back. Otherwise looks like adult. 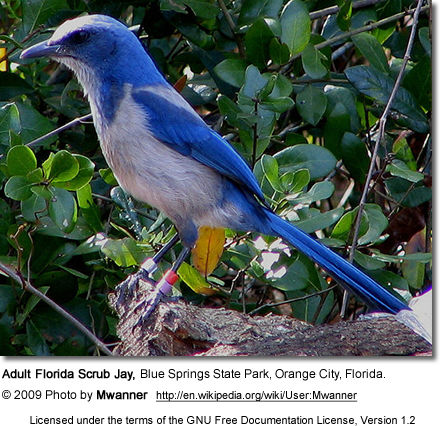 The Florida Scrub Jay is restricted to central Florida - which is far out of the range of other scrub jays. The only other, larger, long-tailed blue birds they could be confused with is the Blue Jay. But the latter can easily be identified by the head chest and white patches on the wings and tail. Animal foods, including insects, such as grasshoppers, moths and butterflies. To a lesser extent they feed on the eggs and nestlings of other birds (including Scrub Jays), and small vertebrates, such as frogs, snakes, lizards and mice. During the summer, the percentage of animal foods will increase, and in autumn or winter, they will more heavily rely on plant foods, including hidden acorns or other nuts. The Florida Scrub Jays are the premier disperser for a variety of oak trees since some of the acorns and nuts germinate in the ground and grow into trees. Florida scrub jays mate for life, but may replace lost partners. Most nesting occurs from early March to late June. The breeding pair will build a new nest each season. The open, shallow cup nest is constructed out of twigs and lined with palmetto fibers or rootlets. The nest is typically placed in dense shrub about 3 - 6 feet (~1 - 2 meters) from the ground. The outer dimensions of the nest may range from 7 - 7.8 inches (18 - 20 cm) and the inner dimensions from 9 - 10 cm (3.5 - 3.10 inches). A clutch may consist of 1 to 5 greenish eggs with brownish spots, but the average is 3 - 4 eggs. The female alone incubates the eggs for 17 - 18 days. The male will guard the nest and bring food to the brooding female. The hatchlings are naked and helpless. They will be fed and guarded by the parents and the nest helpers. They fledge when they are 16 - 21 days, and are independent when they are about 10 weeks old. Their calls vary, but the more common vocalizations include throaty quay, quay, quay, rasping creep, and sweet, loose ch-leep sounds. Females emit distinctive "hiccup" calls when interacting with other individuals. Some differences in vocalizations have been noted in jays found on the Atlantic Coast, in central Florida and southwestern Florida - even though they are separated by less than 100 miles. Reproductive age: 1 year - although most will breed for the first time when they are 2 to 4 years old. They reproduce until they are about 7 years old.